The beauty of this pattern is that it can be made to fit any season with the right colors! 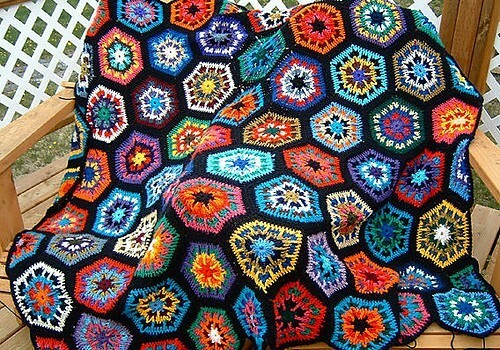 Kaleidoscope by Lisa Donald is a wonderful colorful pattern made of unique hexagons that create the effect of a glorious explosion of color. 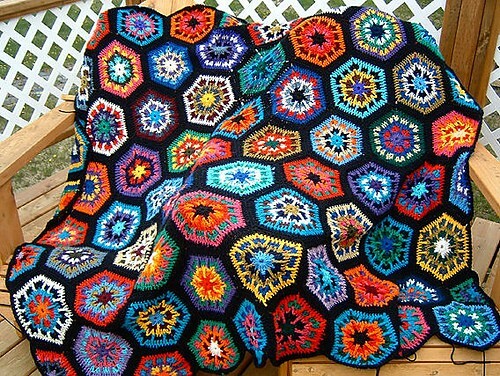 Perfectly beautiful, this pattern is perfect for using bits of leftover yarn. 1 piece of cardboard, 6 x 10 in. Thanks to Lisa Donald for the article inspiration and featured image. So striking ! The black makes it “pop” !